VALPARAISO, IN, March 27, 2018 – Satisfy customers and support future growth – two great reasons RUBBLE MASTER takes over the northern-Irish screen manufacturer Maximus. Founded in 2004 and employing 120 people, Maximus complements the existing range of RUBBLE MASTER products. For customers and dealers, this means a full line of crushing, recycling and screening products is available with the same reliable RM lifetime support and complete parts and service support customers expect. For years, customers demanded screening equipment the RUBBLE MASTER way. Now the wait is over! “This investment allows us to improve our product offering globally, and specifically for the US and Canadian markets,” says Gerald Hanisch, president and owner of RUBBLE MASTER. The venture is already driving new product developments and future growth. 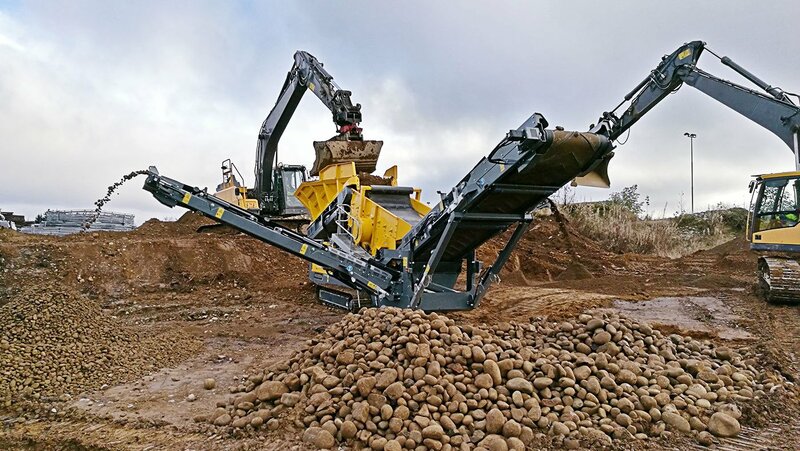 A result of the joint engineering and production capacities are the all-new RM HS3500M & RM HS5000M compact tracked scalping screens, which allow contractors to process a multitude of materials such as excavated C&D waste, asphalt slabs & millings, topsoil, mulch, gravel and much more. Already being nicknamed the “Swiss-Army-Knife” because of its versatility, it’s a must have for any contractor. “This now opens up synergies in many areas. We will benefit from shared suppliers and economies of scale,” reports Günther Weissenberger, RUBBLE MASTER CFO. In an increasingly competitive market RUBBLE MASTER has prepared itself to provide world class answers to future challenges and solidify its leading position among global crushing and screening manufacturers. CEO Gerald Hanisch founded RUBBLE MASTER over 25 years ago when others were tentative about recycling construction and demolition waste. In 1992 RUBBLE MASTER presented the first compact crusher for the recycling of leftover bricks, asphalt, concrete, or other debris. Aggregate obtained this way is used as fill or base material in many industries and projects. Contractors worldwide began to experience the efficiency and profit-making opportunities the machine provided on the jobsite. In 1997 new manufacturing breakthroughs led to exports accounting for over 97% of business, making RUBBLE MASTER a worldwide leader in Compact Crushing. Now RUBBLE MASTER is currently represented by more than 80 dealers in over 110 countries on all seven continents. With its extensive dealer network in the United States and Canada, and a complete parts and service hub in Memphis, TN, RUBBLE MASTER provides superior customer and product support throughout North America.